Testimonials from Paradise Oriental Rugs, Inc.
We had waited for years to find the "right" rug for our living room. We did just that when we came across Penny's web site. What was even better was the personal service she gave us in finding our beautiful rug at a fair price. We finally have what we've been looking for and will return for any other special pieces we need in the future. The rugs I purchased from you look great in their new home and are being enjoyed daily. The antique rugs add a unique warmth that makes any room special. I'm including a picture so that you can see how beautiful they look in my dining room. It is such a pleasure to work with someone so knowledgeable and enthusiastic. Even if another store would match your values (and I haven't seen that yet) you make the experience of selecting the rugs a real pleasure. I enjoy working with you and will certainly return when I need another area turned into something extraordinary. Thanks for these wonderful rugs! We appreciate the degree of thought and care that you put into stocking your store with such special pieces of art! Note: I just shipped this client her 4th rug over a period of three years! "On our left is a recently forwarded photo of one of the earlier rugs purchased, now placed in her kitchen after the completion of a successful remodel.The depth of the colors coupled with the delicate feathery tribal drawing bring a dynamic, harmonious aesthetic to this space, tying all together. The colors in this rug are best described as deeply saturated jewel tones. The soft beige-ivory in the middle of the medallion works perfectly with the floral drapes, wood cabinet and floors. This is an effective display of using a tribal rug as a focal point in the room, bringing all to life. Just right! I have purchased several rugs from Penny at Paradise Oriental Rugs. Penny is very helpful and knowledgeable, and her prices are reasonable. Her store is very nice and she has a huge selection of rugs. Penny even lets us take rugs home prior to purchasing them to make sure they fit and were what we wanted. I would highly recommend talking to Penny if you are interested in purchasing a rug. She knows rugs. I just had to send these photos along with my thanks for your professional guidance and patience. The rugs you found for me are all magnificent , and, beyond that fact,each one is perfect for the space it occupies. You worked so diligently with me to find these items and I want to sincerely express my gratitude. "This client purchased a total of 6 rugs over the last couple of years. She had some very challenging measurement requirements in the upstairs hallways as the hardwood floors had darker decorative inserts designating specific areas. I was fortunate to have the resources to find the exact right sizes with the look and quality required." Well, the rug has arrived and I am thrilled beyond belief. The picture hardly does it justice- the wool is lustrous and soft, the weave tight and precise, the figures and designs unusual and beautiful, and the colors wholesome and rich. I am IN LOVE. Oddly, one of my favorite parts of this rug is the fringe - a perfect extension of the fine, delicate wool warp - it is nearly delicious! Really, it is perfect! I also would like to say again how wonderful it is to work with you. Your appreciation of your rugs is infectious. Your knowledge base is great. And your interest in matching rug to customer (and vice versa!) is sincere. You give freely of your time and spirit. I trust you entirely, to be fair and responsive and dependable and honest. Very unusual, and much appreciated. OK, nuff said. I need to go and be with my rug! Thank you so much for helping me to purchase the perfect rug for my media room! The Qashgai you sent is a really beautiful tribal rug. The weaving is excellent. The design is well executed and filled with animal head motifs (which I love). The colors of the natural dyes in this rug are amazing and the green field color just sings. I have purchased many rugs over the years (some on the Internet) and enjoy them all every day. 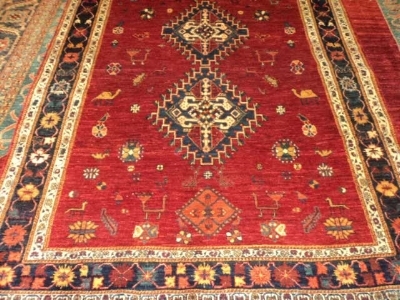 The south Persian tribal rugs are my favorites, so I was delighted to find Paradise Oriental Rugs online this spring. I visited your website multiple times, viewed all your rugs and read through your articles and links before I called you. I am a real "oriental rug addict". The description in the article on your website fits me to a tee and made me laugh. I am hoping to drop by to visit your gallery in California this summer and visit with you in person. It is obvious that you have a passion for oriental rugs and enjoy providing the perfect rug to each customer. I feel that I have found a kindred spirit. Here is a photo of the rug in our dining room. The rug shows up lighter than it looks in "real life". It has a soft golden hue...just perfect for as far as we are concerned. Thanks to you and Matt for all of your help. It was just what we wanted. Thanks again for the icing on the cake! We love it. The rug is in its new home! It is so beautiful, I could not be happier! I truly love it and it is PERFECT for the spot, like destiny!! Thank you and as always, so fun to work together! We found our dream home one year ago today although something was missing. It was warmth and artistry. Carpets were the answer; hand woven, natural dyes, fair trade. This house has become our home! Thank you Penny. You have exquisite taste and great professionalism! These carpets are forever. I had been looking for the “perfect” Persian style rug when I ran across Penny’s site and saw a photo of a stunning Sultanabad rug. It had all the qualities I had been searching for in regards to quality, color and design. Penny’s ardor for quality rugs allayed my reservations about ordering online and I decided to receive the rug on approval. After receiving the rug and unrolling it in my living room, I opened up my window blinds, sat down, and marveled at it luster in the sunlight. Gorgeous! Thanks Penny, it was a pleasure doing business with you! I enjoyed my morning with you and it made my experience buying my first Persian rug an absolute joy. I love my new piece of art! Thank you. I just love the rugs that Penny sold me! I love them more every time I look at them! Her enthusiasm and commitment to what she does shines through even on the telephone. I totally trust her honesty and integrity. The quality of my rugs is amazing and I'm so grateful to have found my "rug expert." Here are a few photos of our beautiful rug in its new habitat. We still can’t believe what a pleasure it was to do business with you. We feel as if we are old friends, even though we have never met. As you know, I found your website after my husband and I had brought home several rugs from local dealers only to find that they did not work in our room. After looking at all the beautiful rugs on your site, and then reading your introductory letter and the customer testimonials, I knew that you were the right person to help us in our quest. When I sent you an email explaining our situation and asking for help, you responded right away. As we talked on the phone that same evening, we looked at and discussed various rugs on your site, and I emailed you photos of all the elements that had to coordinate with the rug we were seeking - the hearth, the sofas, the redwood floors, and the existing rug in the adjacent space. The very next day you emailed us photos of the rugs you thought would work, along with prices, descriptions and your comments. We all agreed on which one would be the best bet, you sent it, and it arrived a day later. It was and continues to be a complete and total success – WE LOVE IT! Thank you for your warm, friendly, straightforward and honest approach. It is obvious that you love your rugs and enjoy finding the right one for each of your customers. Next time we drive down to the Bay Area, we are planning to stop in Sebastopol so we can meet you in person. I want to take a moment to compliment you on the way you answered my many questions on the phone and the interest you took in my project. In all the time I have purchased rugs, you are the very first dealer to ask me to describe the room where I wanted to place the rug. The video of the rug you made for me helped me to “see” the rug from various angles. When the rug arrived I was just thrilled! It was even better than I hoped it would be. Just a note to let you know what a delightful experience it was purchasing rugs from you. When I first saw your selection on your website at paradiseorientalrugs.com I knew that you would have the kind of rugs I wanted. I really appreciate your friendly approach to doing business, and the way that you honored my choices and preferences, while informing me about the rugs. As a novice buyer of oriental rugs I came away from the purchasing experience with beautiful rugs that I will be happy to spend a lifetime with, and a further understanding of this ancient art form. As a devoted collector as well as a merchant of rugs, your love for these hand-crafted treasures shines through, and lends a special quality to the adventure of choosing and bringing home these unique pieces. Thank you for taking your enthusiasm for oriental rugs into the public arena. I appreciate the opportunity that you provide to study and select these lovely tribal rugs that have been hand knotted from hand-spun wool, and colored with natural vegetable dyes. I have developed an abiding admiration and respect for the craftspeople who have created these rugs, as well as for you, who have made them available to us. The rugs that I have purchased from you are now in my home, where they provide so much more than just a floor covering. They are admired by all who see them and are a daily gift, as I find something more to enjoy about them each time I study one. I look forward to viewing your new arrivals when they come, and I hope we will be doing business again. This wonderful store and the owner, Penny, are top notch. We have purchased several rugs from Penny in the last 10 years and have had a totally positive experience. 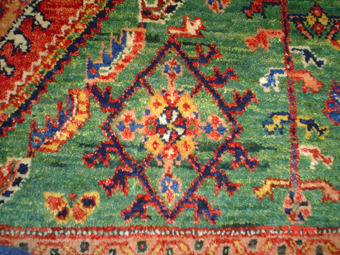 We have been well educated about the rugs, their history and how to care for them. Penny and her staff provide a warm environment that is professional and welcoming. Our rugs have stood the test of time and we will certainly go to Paradise Rugs for any future rugs. The whole process of shopping for rugs with Penny's knowledge and expertise, combined with the beautiful selection of rugs was a real joy. I recommend Paradise Oriental Rugs wholeheartedly. Here are shots of my beautiful rug under my table. I can't thank you enough for your help with finding me the perfect rug. I had looked at hundreds of rugs on line before I found you and did not find anything near the variety and quality of yours. I also greatly appreciated your knowledge and expertise. Not to mention what a delight you are in doing business. I look forward to another purchase in the near future. The rugs are perfect! No questions here. They are locked-in and part and parcel of my environment... just so right!!! Thank you a jillion for being so accommodating. LOVE the runner in place, just as I suspected I might.... and special hi to big boy Dante! I discovered a new world when I entered Penny's shop earlier this year. I fell in love with Oriental rugs! They are not only objects of beauty and practicality but also reflections of an ancient tradition. Penny has a knowledge of and passion for what she is selling. She has such a variety of wonderful rugs from Persia, the Caucasus, Turkmenistan and Afghanistan, just to name a few of the rug producing areas represented in her shop. I am so happy with the rugs Penny helped me select for my home. They surprise me with their beauty daily. Just a quick note to tell you that the Persian Khamsebaf rug we chose last Thursday (with the help of Matias!) at your shop is PURRFECT and makes the kitchen dining area SPECTACULAR!! We all love it! Look for us after the new year to choose the perfect same excitement for the dining room! After just purchasing my 4th rug from Penny at her gallery, Paradise Oriental Rugs, I have found that these rugs pay for themselves over and over and over again. They add so much enrichment and beauty to my life every single day! If you want to feel like royalty buy "real rugs" as there's no comparison with their inferior counterparts! We have bought four rugs from Penny Krieger. We are committed customers, in fact if our house were bigger we would have more. We've been in the stores and seen who has got what, and Penny's rugs are the best. She also makes it fun to buy them. Her knowledge and taste for what we want are a big part of buying from her. It's not like a sales circumstance, but a fascinating conversation with a friend. A very involving friend, as her love for these rugs is infectious. When the conversation is over we get to walk away with beautiful art to put on the floors of our house and enjoy every day! Thank you, Penny. You are the best! The three rugs I purchased from Penny are all exceptionally beautiful one-of-a-kind tribal rugs. They are each the focal point of the rooms they inhabit. I feel so fortunate to have these wonderful works of art in my home and to have Penny as my rug supplier. Thank you for selling such beautiful rugs! I truly love each one you have sold me and most of all, thank you for your friendship and thoughtfulness. I just can't express how ecstatic I am with the rug, "The rug of the Dream." I am amazed every time I look at it! This is exactly what I wanted when we started discussing another rug two months ago. I love it! I love it! I love it! Thank you for all your help and I look forward to getting several more from you. I am so glad I found you and your magic carpets. I feel so blessed. Thank you for everything! We are so happy with our beautiful rugs. The kelim looks wonderful in the bedroom. Thanks for all your help. Penny's knowledge of carpets is extensive, and her passion is obvious from the moment you meet her. She had the perfect carpet for me, and I've loved it since the day I brought it home. Totally love your website Penny, I could not continue my day without thanking you for the education. Thank you so much - for everything. The rugs create complete rooms for me. I just LOVE the new feel of my home. I couldn't be happier with these awesome blue rugs. Is it possible to fall in love with a rug? Absolutely. Not only did Penny "size up" my needs, she was wonderful to work with. The quality and workmanship of this handmade rug is astounding. I love watching how the colors light up from different angles and times of day. What a beautiful addition to this space. Client's beautiful puppy on Mom's new 4 x 6 Ushak rug!